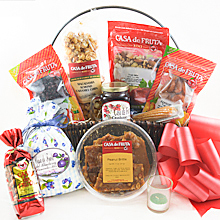 Say thanks with this basket of goodies. Butter Toffee Pecans 6 oz. Farmers Pop off the Cob Popcorn 2.5 oz. Net Wt. 89 oz. Ship Wt. 9 lb.